The Church of England has sold its shares of Vedanta Resources saying it is not happy with the way the metal corporation treated tribals of Orissa’s Kalahandi district. The sale of shares, on February 5, worth US $5.8 million, was followed by an Amnesty International report on human rights violation in the Niyamgiri hills, home to the Dongria Kondh tribals, and in Lanjigarh where Vedanta operates an alumina refinery. Vedanta proposes to mine the hills for bauxite to feed the refinery which the tribals oppose. The Church’s advisory group on ethical investments had sent a representative to Orissa in November 2009 following pressure from activists to give up its stake in the company. “After six months of engagement, we are not satisfied that Vedanta has shown, or is likely in future to show, the level of respect for human rights and local communities that we expect of companies in whom the Church investing bodies hold shares,” said a statement issued by the Church of England. The Amnesty report released on February 9 said the Lanjigarh refinery is discharging waste into the Vamsdhara river nearby, which villages use as their drinking water source. Amnesty International’s South Asia researcher, Ramesh Gopalakrishnan, said the Orissa State Pollution Control Board (SPCB) was aware of the problems with the refinery but was still considering a proposal for increase in the refinery’s capacity, from one million tonne a year to six million tonne. Vedanta claimed the report of Amnesty International is based on outdated documents. 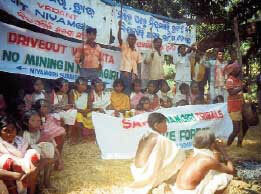 “Vedanta has repeatedly offered engagement to Amnesty, including joint verification of allegations in the villages. But this offer was rejected,” a company spokesperson said. On February 15, the National Environment Appellate Authority (neaa) iterated that it will hear the appeal against the environmental clearance given to Vedanta to mine bauxite from the Niyamgiri hills. The appeal filed by environmental activist Praful Samantra was admitted last May; this was challenged by the Orissa Mining Corporation saying the matter had been decided in the Supreme Court. Counsel for petitioner, Rahul Choudhary, said the Supreme Court order favouring Vedanta related to forest clearance whereas the appeal before neaa relates to environmental clearance. “This is the first time that the Dongria Kondhs’ reasons for opposing the project will be heard by a court,” said Choudhary. Samantra’s appeal has pointed out inconsistencies in the environmental clearance granted by the Union environment ministry in 2008. It said the environmental impact assessment (EIA) report filed in the ministry by Vedanta differed from the one that was shared with the tribal people during public hearing. Two consultants who prepared eia reports for the project—Tata aig Risk Management Services and Vimta Labs Ltd—differed on the project’s impact on people and environment. Neither of the studies was comprehensive, the appeal said.